The year was 1985, when a young dentist decided to take computer classes at a Public University in Dusseldorf, Germany. He was seeing that more and more, computer terminals were popping up in the windows of a lot of businesses, especially travel agencies. He decided to learn about computers, so he could keep up with the trend that seemed to be emerging. His computer professor at the Volkshochschule in Dusseldorf, asked him after the third class, to come up with a specific field where computers could be applied to dentistry. This dental student came up with some common applications, such as record keeping, scheduling, and database optimization. But he happened to come across another application that he glimpsed as potentially important – computer mapping of objects with resulting 3D models which could lead to CAD-CAM fabrication of dental prostheses (inlays, crowns, dentures). His teacher was amazed at this possibility, and encouraged our young student dentist to look into it and try to make it practically applicable. The young dentist was me, at the age of 28, and I found myself immersed into a new computer application field: the contactless acquisition of 3D data of a dental field (optical impression), followed by the use of the data in the fabrication of dental restorations, for example crowns. 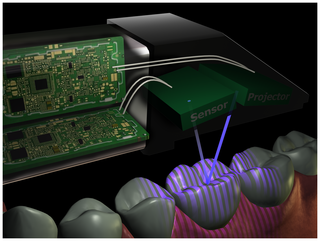 Working with a team of computer specialists and physicists from the University of Dusseldorf, we came up with a concept prototype and submitted for a patent for a contactless device to capture 3D images of the mouth. After several failed attempts to convince the huge monopoly Siemens corporation to buy our patent and concept and develop it into a sellable product, we dropped it and cut our losses, and… forgot about it. Fast forward 28 years and now as a dentist practicing in the US, I have decided to purchase a commercially available intra-oral scanner that allows the acquisition of the 3D data, basically a digital impression of the mouth. It is a similar device that I designed 28 years ago, surely better, more robust, less expensive, and available from a Danish company called 3Shape. The intraoral scanner I’ve been waiting for almost three decades is called TRIOS and it is a dream come true for me to be able to finally work with it. It has arrived only a week ago, and I am absolutely excited to finally be able to work with a device I have envisioned three decades ago. I’ll keep you posted as to how the training and implementation works out.